What does your home taste like? Sometimes I feel the world has lost touch with it's roots. We're combining goat's cheese with caramel and roasted strawberries in a cheesecake (I made that once), but nobody seems to remember how to make an original pound cake (hint: it's a pound of every ingredient). People buy fig bars with cacao and pistachio's, but need to rely on their grandmother for a real apple pie. When did we loose touch with our roots? So that's what I blog about: basic recipes, techniques and traditional food from all over the world. I love exploring different cultures, eating habits and food traditions from different countries. On top of that, I want to focus on the sweet side of life. I'm Siv. I'm a 20-something just-out-of-uni random woman, who loves to bake and play around with her camera and learned to do that aalll by herself *proud*. I don't like to talk about myself much, but I'm assuming you're here to learn 'about me'. So that leaves me no choice. I'm about 1,62m TALL small. People call me tiny (jokingly, I think). I'm a curious sorts of person by nature. I like to know how, and when, and what, and most importantly WHY. I love going exploring and I do so very much enjoy going for tea or coffee. Quite ironically, I'm also quite an introvert and don't go out much (also I can't have caffeine). I like to think it explains my lack of social media skills, which seems to be a crime these days. I've lived in The Netherlands, Thailand, Northern Ireland, Holland and Greece. There's such vast difference between the food cultures in these countries it keeps amazing me. And it inspires me every time again to make something that makes others feel home. "There’s a whole world of food out there"
- Lastly, I daydream of becoming a superhero and saving the world. 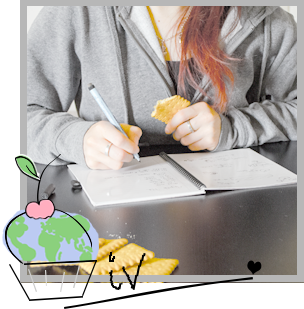 Wonderul to discover your blog via Foodie Penapls! Hope I receive your name one day to send you some Welsh goodies!